This post continues a line from my previous post about seeing the foundation of the Christian community as an act of artistic vision and commitment. God’s call to new life and creative innovation always happens in community no matter how much we as individuals experience this creative energy stirring very personally in our own hearts. Luke makes it very clear that neither actually sees what God’s call is apart from one another and apart from the gathered community. Even Peter and Cornelius meeting alone would not have been enough to clarify things. Though we often think of artists working in isolation, or romanticize art as the lonely call of a ‘genius’ hearing intimate things no one else can hear, the truth is that all art is communal of its essence, as it is about opening the aperture of a community’s heart to new things–it aims to communicate something fundamental about community and its blindnesses: “This is what I see, I don’t know quite what to make of it. What do you see?” If I as an artist see something previously unimaginable, I work to bring this vision to life in order to have the community help me see what it means, what it intends, for all of us. Art lives then at the intersection of profound insight and radical unknowing and is an inherently political act when we understand politics in its root meaning as the art of living together in harmonious creative play. Because vision requires this shared discernment even as we have powerful intimations that God is doing something new and in a unique way with us each as individuals, we must gather and listen together to the word, behold the vision. This is actually the most important reason why the church gathers regularly each week and sometimes more often and why it is simply not possible to be a Christian or a spiritual being apart from some kind of gathered community. We don’t know the communal meaning of what we see otherwise. What Acts 10 tells us is that we should be careful of defining that artistic spiritual community too narrowly, for God has a way of bursting open doors we didn’t even know were there! * for you philosophy types, the greek word here for puzzled is διαπορέω [diaporeo] a variant of the verb ἀπορέω from which we get the word aporia. Gurdon Brewster’s Jesus and Buddha dancing ecstatically. Are you sure you can tell who is who? St Peter would be proud I think! We celebrate the feast of Sts. Peter and Paul today. To Peter we owe our militant refusal to identify God’s ways with our own. When he insists that we not judge or criticize God’s re-making of our very identities, he becomes the patron saint of all artists. For art is above all the ‘ecstatic’ science, one that takes visions with ultimate seriousness, even when these visions undermine who we thought we were and where we thought we were going. True art is fearless, seeing possibilities for new life even in the monstrous mixing of categories, identities, and story lines. So Peter took and ate the unclean animals and his spirit was nourished and expanded. It is hard to underestimate the radical nature of Peter’s faithfulness to this vision, one which revolutionized the church’s mission and opened it up to continual revisioning and spiritual leaps of creative and often improbable connection. His friends who wanted to keep everything in its proper place criticized him (διακρίνω) and insisted on being reasonable above all else–surely a vision by a man literally out of his mind cannot be the basis upon which we are to be reborn? We are who we are, who we always have been, and to suggest otherwise is to be more than ecstatic, it is to be a revolutionary. For some, he was undoubtedly seen as quite beside himself and mad. That’s our Peter, church. Are we so bold as to follow? Peter insists that the vision he has seen is of God and then he holds relentlessly to the discipline of re-building his life and the life of the community around this vision. It will be hard work, full of mistrust, desires to clarify and codify and delimit what is a whirlwind, a colorful mixing of metaphors, not to mention families, languages, peoples, and nations. We will be tempted to cleave to the safe shore of our familiars, but Peter the artist will boldly lead us into the blooming and onto the whirling wheel of life. “The Spirit told me to go with them and not to make a distinction (διακρἰνω),” Peter insists. When we think of that rock of the church, Peter, as a spiritual artist then we can begin to see art and artists in a different way. Artists are not, as is often thought, impulsive dreamers, rogues, or ne’er do wells (well, okay, sometimes they are ;-)) but principled and discipline followers of visions and promptings of the spirit, and they tend to contemplative silence and communities of radical hospitality. The are protean in their willingness to be re-formed, de-formed, and in-formed by their vision, and so they are often allied with the mystics and the misfits of society. But they are seriously grounded, as Peter was, upon the reality of what they see which is why they align with other scientists in their insistence on being true to what is seen and heard. Artists learn the hard way to either get out of the way of the work or be damned to ugly narcissism. Contemplative silence is therefore crucial, a prayerful attentiveness in which self-aggrandizing distinctions, premature criticisms, and risk-averse judgments have little place. Vision and discipline together lead to humility and awe before the ways our creator gives us the task of extending the creation in our own lives. And so we should not be surprised that Peter’s words lead to this outcome: Hesychia (contemplative silence) and praise. All truly spiritual art begets more of the same. I had a rather longish conversation the other day with a new artist friend who is not much of a churchgoer. And though this is the second or third of these wide ranging and quite stimulating conversations I have had at this friend’s request, it seems fairly clear to both of us that this is not likely a prelude to a ‘church’ conversion. I do not feel I am being ‘interviewed’ by a potential congregation member and I hope and trust that he does not feel I am trying to soften him up only to pull out my crook and wrastle a ‘wayward sheep’ into the fold. Like the singer in the classic Kris Kristofferson ballad, Sunday Morning Coming Down, my friend has his own way to the divine and the ringing of church bells and the sound of bibles thumping tend to make him feel more at sea with the heebie jeebies than anything else. Church “makes the body feel alone,” as the singer puts it, and so he ambles on his Sunday morning way, more like Thoreau along the Merrimack River than a sinner heading to the anxious bench. Perhaps my friend was a bit surprised that I, his companion with the dog collar, was not troubled by this reality. One suspects, given his deep spiritual inclinations, that this was not the first such conversation he had had with a professional religious. One also suspects that in many cases, hopefully not all, he had felt the pressure mount as the clergy tried one end of the stick and then another to convince him that church was not lonesome at all. How could it be, if it had faces as friendly and sympathetic as the winsome priest’s, which was smiling invitingly across the table?! Evangelism can be a sly little devil as sweet as honey and soft as butter even when it has swords up its sleeves ready to be drawn. 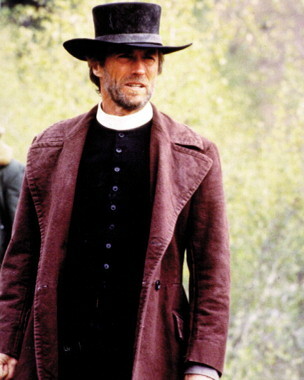 What he, the artist friend, didn’t know, was that one of this priest’s favorite songs is Preacher by Ray Wylie Hubbard. One listen to it and you’ll know why the priest was not at all perturbed about the state of the soul of his new friend. The Cosmic Cowboy long haired Texas Hippie looking righteous and cool in purple. Now that really preaches! And it is the mundaneness too that the reluctant artist ‘evangelee’ highlights. Its not bright lights, big city, or flashy cars and loose women that the singer is ‘tempted’ by. No, its his beloved ‘hanging clothes on the line,” that floats his boat, and in just a single line Ray has taken us to the depths of his own recovery spirituality, where “keeping our gratitude higher than our expectations” leads to really good days. Ray is dedicated to this woman who has given him as much of the divine as his heart can handle and given it in the flesh. And it is crucial that unlike the preacher’s reach upward for the slightly unreal vapors too many addicts are prone to being seduced by, his sensuous mystifying angel “stoops down low,” keeping it both real and real humble. The contrast is sharply drawn between the preacher’s arrogant assumption that he and he alone has the truth and the singer’s simple gesture of pointing to something else. Its not that he denies the truths of the preacher. Its simply that he wants the preacher to see that God’s beauty can be found everywhere, even in something as simple as “drudgery divine,” as the great Anglican priest and poet George Herbert puts it. A different kind of preacher: the long haired English hippie freak and priest George Herbert! At this point in the song, the preacher heads off. Here the ambiguity is both tantalizing and full of potential mischief. Has the singer’s sensual spiritual ‘preaching’ of his own bested the full-of-himself bible-thumping evangelist? Perhaps. Is the preacher “shaking the dust off of his feet,” as he goes, scornfully lamenting that ‘here goes another one off to the depths of H.E. double hockey sticks?’ Maybe. But here I confess that I’ve always been drawn to a third option, one that the song seems to allow though certainly not insist upon. Perhaps the singer is a better evangelist than he knows, or maybe its his woman who’s really got the preacher’s gifts in spades and black ink, and it is they who have converted the preacher! I like to imagine that the preacher too has a woman back home, one who has sadly been neglected for countless days and nights as her righteously cold hubby has been singularly obsessed with his heaven, others’ hell, and his own work, to the exclusion of his household chores and his woman’s many blessings. “He took off down the road,” Ray sings, indicating that he was in something of a hurry. Maybe, just maybe, his heart was strangely warmed by his ‘conversation with the devil‘s’ minion, and he suddenly awoke from his dogmatic slumbers and into a life of newfound beauty, love and holy desire. Perhaps what I mean to say is this: even preachers have beauty and beauteous creatures in their lives. Sometimes it takes a “band of heathens” or two as friends to make that beauty come to life for them. That is why the preacher needs art and artists as friends. To make the body sing electric, righteous, and holy. What a gift for a preacher to learn how to sing the blues!